Michael (Paul Walker) is a young man who has fallen in love with the wrong girl. He's would-be girlfriend, Tammy (Denise Richards), is the subject of unwanted affection from Billy (George Pilgrim). Billy decides to dispose of Michael by luring him into being eaten by a lion (no, really). Wounded but not dead, Michael is then kidnapped by Dr. Wachenstein (Terry Kiser) who needs a fresh human brain for his robot T-Rex. If anything can be called impressive in a movie like Tammy and the T-Rex, it’s the fact that it is never less than 100% invested in its own ridiculous premise. True, it can never really settle on a tone; at times it tries to be a goofball romantic comedy, a gross-out horror film, and then stunningly attempts a tragic climax. This is a film that commits to telling a story about a man trapped in a T-Rex’s body regardless of the consequences, so if earnestness is a virtue, this movie is filled with it. The biggest laughs come from the T-Rex using his stubbly little arms to do everyday things. There’s no attempt whatsoever to present this with even a hint of logic. The robot’s arms seem to stretch to whatever length is necessary for the scene, thereby adding to the already weird image of stubby t-rex arms dialing a rotary payphone and then checking the slot for change. Most of the characters are gratingly over the top, especially Dr. Wachenstein (Terry Kiser), and the embarrassing gay caricature of Byron (Theo Forsett). Denise Richards has never been a strong actress and she keeps that tradition alive here. A frighteningly young Paul Walker acquits himself well enough, and actually his voice work, is not bad at all. 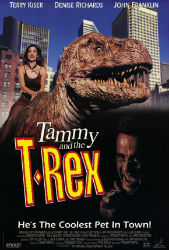 Once the actual plot gets underway, Tammy and the T-Rex wisely doesn’t linger on any one moment for too long. I was actually surprised that Michael gets most of his revenge out of the way rather quickly. Unfortunately, this leads to the middle of the story sagging as we are forced to watch the characters fumble around looking for Dr. Wachenstein, while avoiding the law. This all leads up to a classic finale that pits misunderstood monster versus clueless authority figures and it plays out exactly as you expect. It’s best to enjoy Tammy and the T-Rex in the moment; it possesses a witless charm about it and any expectation of competence or structure would be a letdown. This film was a staple of the USA channel’s Up All Night television show, and with good reason. It almost begs to be viewed in segments. It’s enjoyable nonsense and had it come out ten years later it would probably would have been an internet sensation not unlike, The Room (2003), or Birdemic (2010). Tammy and the T-Rex is exceptionally fun, despite not being very good at all. If you enjoy absurd trash, and I sincerely hope you do, I would definitely seek it out. The movie currently only has a VHS release but is available in its entirety on Youtube. There have been rumors of an ‘R’ rated edit that contains a significant amount of added gore, perhaps one day, some enterprising distributor will find a print and release it in glorious 1080p.